We have marked a distinct position in the domain by manufacturing and supplying the finest quality Natural Seabuckthorn Collagen Serum. Visibly improved skin tone and glowing skin with this de-pigmentation cream with sea buckthorn, our offered serum is well processed under the stern vigilance of dexterous professionals using quality tests natural herbs following the defined industry standards. We offer this serum in hygienic packaging options to our patrons. Its properties help lighten skin tone and brighten skin tone for that extra fair and brighter skin. Visibly improved skin tone and glowing skin with this depigmentation cream with Seabuckthorn, it infused -this advanced natural formulation with Seabuckthorn seed oil , various extracts, it will help improve skin tone caused by exposure to sun and the ageing process. Its properties help lighten skin tone and brighten skin tone for that extra fair and brighter skin. Hydrolyzed Collagen, Hydrolyzed soy protein, Seabuckthorn seed oil and skin oil, Mulberry Root Extract, Bearberry Extract, Lecigel. Intensively nourishes and hydrates and brightens skin, Improves skin tone, Visibly improves sun damaged skin, Enhances natural repair process of skin, Helps to lighten skin tone, For all skin types. 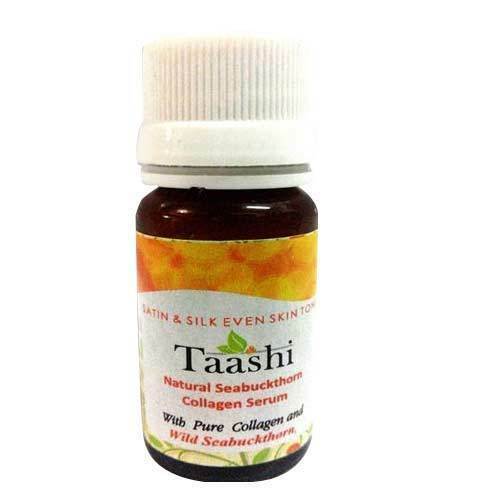 Taashi premium skincare products are made from premium wild himalayan seabuckthorn berries which are a sustainable resource growing wild in the Indian Himalayas. No growth hormones, fertilizers or pesticides are used in the growth of the same. Heaven’s Holy Fruit, the wonder berry from the Himalayas- wild seabuckthorn is known as natures most balanced fruit. Seabuckthorn contains more than 190 biologically active compounds. Seabuckthorn supports healthy cardio vascular function, Sustains proper brain and nervous system function , Promotes healthy skin and hair, Enhances integrity of mucous membranes, Supports healthy digestive system function, Promotes healthy urogenital lining.